Well, if this was an example of a French stormy day, bring it on. There were a couple of spells of rain overnight – other than precisely three drops when we were out scouring the countryside for Francine’s orchids this was the first rain we’ve had – and the morning did dawn with a solid grey overcast but that soon disappeared and blue skies returned. That tiny amount of rain will have done nothing for the water shortage currently being experienced. Still, every missing cloud has a silver lining and blue skies are good for the tourists. We’d thought that yesterday would be our last active day here but we hit the pedals again to make the most of our good fortune. 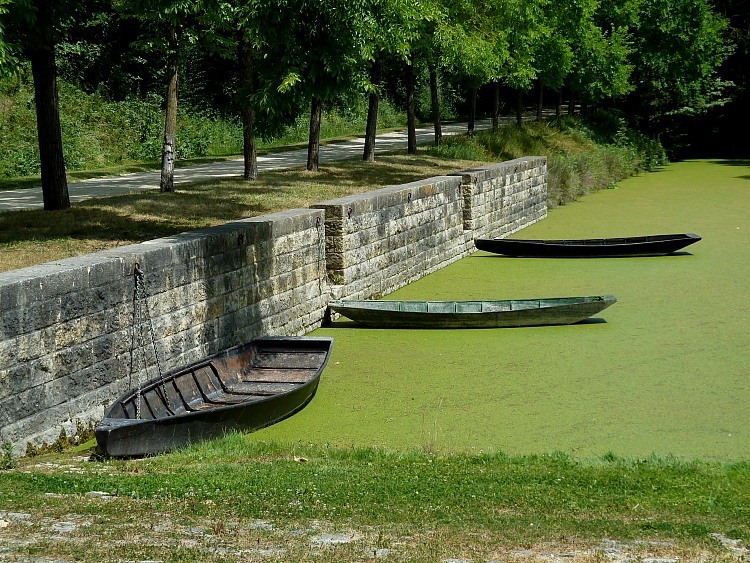 The Marais Poitevin is also subtitled Venise Verte [Green Venice]. The “Venice” bit is pretty obvious, it’s to do with the low-lying area being crisscrossed by almost countless drainage channels and canals. 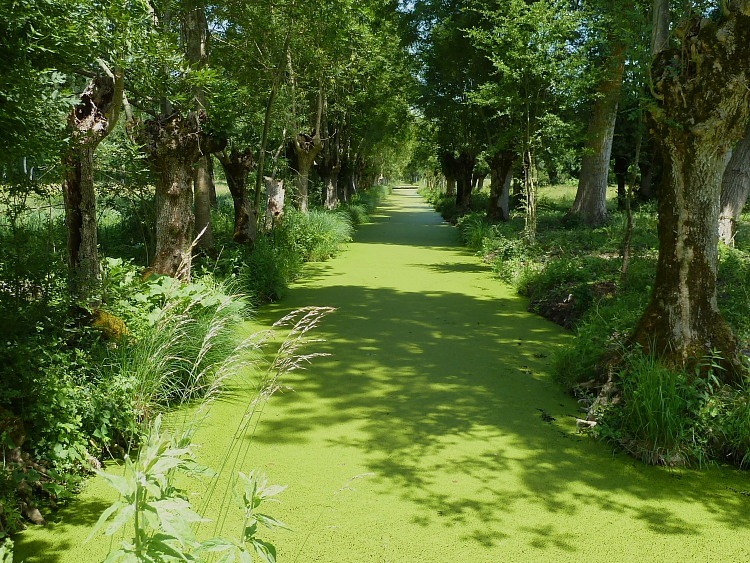 The “Green” bit is to do with the channels getting completely blanketed in floating, bright green duckweed. On previous visits, this green colouration has been very prevalent but this time we had hitherto seen very few channels sporting their traditional green overcoat. Our friend, Mike, has a theory that this reduction is connected to there being rather less sewage dumped in the canals nowadays. Hmm. Less nutrients = less duckweed. Sounds plausible. Today we cycled to a different section of traditional marsh around Amuré and found some excellent examples of the bright green channels we had come to expect. Yikes, don’t fall in here! One shot is of a village’s embarcadère and also shows some splendid examples of the traditional flat-bottomed barques used as transport around the canals in the marais. 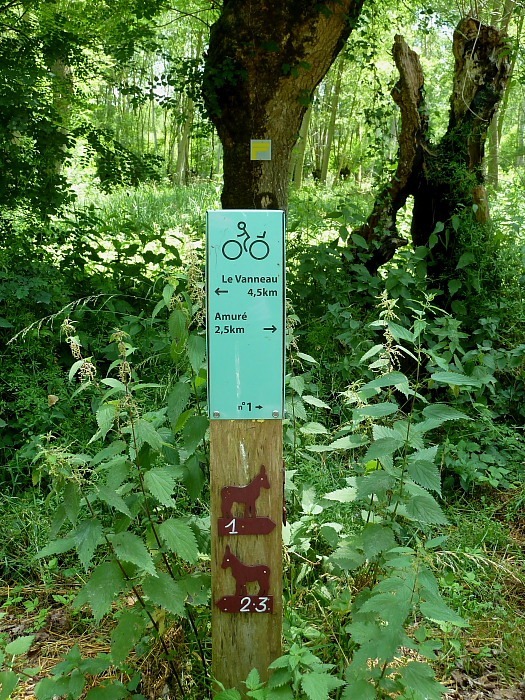 We are quite used to the signs for the bicycle routes, les pistes cyclables, and for the French walking routes. This photograph shows the light blue cycle track signs used around here and, on the tree behind, you can make out one of the walking route signs which are pretty much universal to France. Check out the post below the cycle route signs, though. Here is something we’ve seen only in the Amuré marsh: donkey routes. How utterly charming.